Card Games: Playing Card Games for the Whole Family to Enjoy! These Card Games are Fun for the Whole Family! 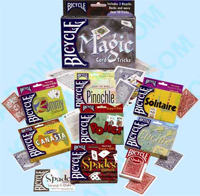 Bicycle Card Games – We offer a complete line of Bicycle Playing Card Game Sets. Each set contains one or two decks of playing cards and a strategy / rules guide. With these sets, you can learn a new game or improve your skills for an old favorite! 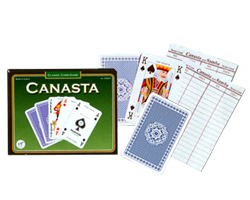 Canasta Game Set – Piatnik Brand Canasta Sets feature two decks of Playing Cards with point values on the cards and the same color card backs. Canasta rules and score sheets are also included. Each Piatnik Canasta Set comes in a sturdy cardboard box that protects the cards when in storage. Euchre Game Set – Piatnik Brand Euchre Sets feature two decks of Playing Cards, Counters and Rules in a sturdy cardboard box to protect the set when not in use. Feel free to browse our other Playing Card Choices and Family Games including, Pokeno, Checkers Sets, Cribbage, and More. For a free 104 page casino gaming catalog, please use our online form or simply call 1-800-233-0828.